There are lots of different ways to block knitted and crocheted items, but they all share many similarities. Here are some fantastic ways to block your knits- and you’ll definitely pick up some new tips. We’ve been fortunate to have some great reviews and love from all sorts of crafty bloggers, and we thought it would be great to share the tips and tricks for blocking your knits that have featured Eucalan! 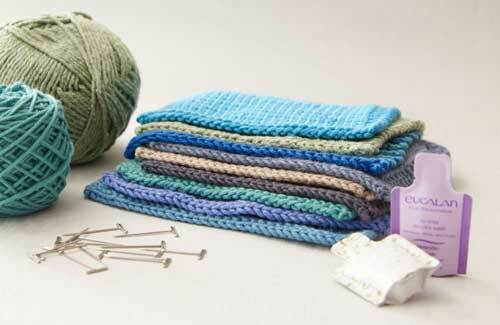 How to Spray Block Your Knit and Crocheted Items. The Spray technique is a great way to cut down on drying time dramatically. Read all about it here. Top Tips for Blocking Your Knits, from the famous London Loop yarn shop. Especially great tips for blocking lace, and swatches. 3 Different Ways to Block Your Knits – knits that need to be seamed, items made in the round, and the speedy steam blocking method- all great techniques. How to Wet Block a Sweater, from Flax & Twine. Wet blocking larger items like a sweater takes a bit of effort, and this is a great step-by-step. Knitting Expat has a great tutorial on how she wet blocks her knits, and her towel method for removing excess water after wet blocking is a must-do. How to wet block a hat- hats can be tricky, but this is a great tutorial. With a little bit of guidance, you can do it! Are there any blocking tutorials you would like to see that we haven’t covered? Let us know in the comments! We have something special for you this holiday season- a FREE knitting pattern for a gorgeous two-colour cowl, designed by Julie Crawford of knittedbliss.com. This is the Eucalan Lattice Cowl, which is knitted up in two colours of worsted weight yarn and shown here in Kristin Omdahl’s Be So Brave yarn, 100% American wool (worsted weight) in colours ‘Picket Fence’ and ‘Plymouth Rock’. Not to mention that it is a pretty quick knit, so there is still time to knit one or two before the holidays- either to give as a gift, or to keep for yourself. The main colour (Picket Fence) requires two and a half skeins of Be So Brave Yarn, and the contrasting colour (Plymouth Rock) uses only 2 skeins. And the best part? The cowl is super easy to knit! All the stitches are knit, purl, or slipped. The stitch pattern is easy to memorize, and is both written and charted. You can get your free pattern right here, just by signing up for our newsletter! Want to tell everyone about this awesome free cowl pattern? Share it on Pinterest! Knitting lace can be a wonderfully satisfying challenge, but it takes a good wet blocking to see the complete transformation from a bit of crumpled up loops and stitches to the full beauty of a lace design. Wet blocking lace can be intimidating, but it’s easier than you think! Here is a full tutorial on how to do it, step by step. Fill your sink or bowl with tepid water, and add one capful of Eucalan in the scent of your choice. Gently place your knit in the water, and gently swish it around, ensuring that it is completely saturated. Remove your knit from the water (no need to rinse with Eucalan!) and roll it firmly in a towel to remove excess water and moisture. Lay your knit out on a large surface. You can use a bed, blocking boards, some thick blankets, anything that works for you. When pinning out your project, follow the main shape before pinning out any details. This means that you will start with the basic outline and pin all the straight edges before concentrating on more specific design features. Here is where the measuring tape can be very helpful – if you have two straight sides, you can measure to make sure they are both the same length. When pinning out scallops or lace loops, use as many pins as you want, pinning each loop into place. it takes time, but it is worth it. If your project has straight edges, blocking wires can be really helpful. You insert the wires through the loops in as straight a line as you can, and pin the blocking wires into place. Step 5: Leave it to dry. once your knit is completely dry, unpin and remove blocking wires, if used. If you have pets or small children, pin out your lace somewhere where you can close a door to keep them out, or on something you can move to a place where they can’t touch it. If you like to knit lace, it might be worth investing in T-Shaped pins and blocking wires for really crisp definition and blocking. Otherwise, stainless steel sewing pins will work just fine. It takes a fair bit of time to pin out something with a lot of detail, so be sure to give yourself plenty of time to do a good job. If you would like to get everything you need for blocking all at once, we really like this blocking kit from Cocoknits. Ah, spring! A time when everything feels fresh and new, or at least you want it to feel that way! Spring is indeed a great time to freshen up your home and wardrobe, but that doesn’t mean it has to be all work. Here’s a round-up of our top spring posts to get you in the mood to freshen up your wardrobe, your home, and your routine! Click here for great Tips for spring cleaning your wardrobe. Click here for the best tips for spring cleaning your home to get it feeling airy and fresh. With Earth Day upon us, here are 4 ways to celebrate Earth Day all year round. But it’s not all cleaning – you have to make time for a bit of fun! Click the links below for crafts, recipes and fun decor ideas. Think Spring – Time for a bit of fun! Of course, this list wouldn’t be complete without our most recent spring post, all about the best way to shift your wardrobe from winter clothes to spring. This is a guest post from Julie Crawford, and previously appeared on knittedbliss.com. We loved it so much we asked to repost it here so that Eucalan fans can learn all these important tricks for recycling yarn! I don’t often do tutorials, but I have recently learned SO MUCH about how to reuse yarn from a knit that I had to share it with you guys. In particular because I’ve finally decided to turn my Delineate Tank into a Manzanilla Sweater, using the Spirit Trail Fiberworks yarn that I loved so much the first time around. I had almost two full skeins leftover from the original project, so this sweater will be a mix of unused yarn AND recycled yarn, which will have its own considerations. First, let’s recycle the yarn. Types of yarn- the ‘stickier’ a yarn is, the harder it is to rip back. if there is any mohair or angora in it, it will be cling to the stitches, and not want to be easily undone. It can still be done, but you’ll need to go more slowly. A note about the wool wash, in case you are wondering why I’m declaring Eucalan as my fave: I’ve tried other kinds, but I always come back to Eucalan because I get a lot of product for the price, which means more washes. It’s totally biodegradable and made with natural ingredients, and I also really like that the cap and top of bottle seem to magically stay clean and never get gummed up or sticky. My favourite scents are Pink Grapefruit and Jasmine Wrapture, but I’m using classic Eucalyptus scent for this tutorial. If you look closely at your hems and where you bound off, and pull a bit at the fabric, you will be able to see the tiny tail of where the ends were woven in. You can use a crochet hook or a blunt tapestry needle to begin pulling it loose, until you can then undo the cast off. If at any point prior to this you can’t find the end or the knot you pulled when you cast off was so tight there’s no way you’ll undo it, then you can always get some scissors and snip out the cast on edge. Start pulling. You may need to pause now and then, especially with flat knitting, as the sides tend to be a bit stickier. You will need to make a new ball for each section of yarn that you have. So, as you are winding and come to the end of the skein in the knit, put that ball aside and start a new one with the new end that you find. Bath time! Pour a capful of Eucalan into a sink filled with warm (not hot) water. Immerse the yarn. You want to ensure that the yarn is fully saturated, and not floating on the surface. Push it down until it’s absorbed a fair quantity of water, and let it sit for about half an hour to help the fibers get fully relaxed. After 20 minutes, take a look at the yarn – is it still a bit crinkly? Then it needs more time. Continue soaking. If it’s relaxed, then drain the water (no need to rinse), squeeze out the excess water gently, and roll in a towel to remove more of the water. Hang to dry away from heat or light, a shower is a good place for this. You can then wind your yarn into a ball, or into a hank, both are shown below. Here is a 1 min video showing how to wind your yarn into a hank (the long one that looks like a pastry), which is ideal if you aren’t going to be using it right away. Hedgehog is just for visual interest. I was trying to get one of the cats to lay beside it, but when was the last time a cat did anything you wanted it to do? Now, before you dive into your knit, if you have a mix of yarn you have recycled AND yarn that hasn’t been used (like me! ), then you want to keep the following in mind. I would like to give a big shout out of thanks to Celeste, a previous commentor who emailed with me about this, and had wonderful tips to share. Cotton and acrylic might not change a lot in the process above, but wool, wool blends (and alpaca) can stretch a little or a lot. It could also have stretched a bit, if you hung your washed yarn up to dry, rather than laid it flat. Once a yarn is washed, it plumps up, filling in the space between fibers. Unwashed yarn won’t have done this yet. So you know that this will affect your…. Gauge!! You will need to do a gauge swatch in both your washed yarn AND your unwashed yarn to compare, and see if there is any difference. There could be a very big difference, and you want to know before investing a sweater’s worth of time into a knit. Genius, right? So if your yarn is showing a difference, then simplest solution is to wash all of it, both the used and unused yarn. If it is treated the same way and more likely to behave the same from one skein to the next. There you have it! How to reuse your wonderful, precious yarn. If you’ve invested all that time into creating a knitted piece, it should be something you love to wear. If it isn’t (once you have completed the 6 emotional stages of frogging a project) and you love the yarn, why not give it a new lease on life? You might knit something you can’t live without this time! If you liked this post and found it useful, why not Pin it? With the changing of seasons, much of our summer wardrobe will be set aside and our fall and winter clothes will make a comeback. Most people either have their clothes in their closets year round regardless of the weather, while others pack things away when the seasons shift. Regardless of your storage preference, it’s worth taking some time to properly care for the clothes that you probably won’t wear again for another six months. Moths are a harsh reality for some. Even if you have never had any, there’s always a chance they could happen. As it’s extremely difficult to get rid of moths once they discover your closet, preventative care is really worth it. If you store out-of-season clothes somewhere outside of your home (for example, a garage, shed, or storage locker), you will definitely want to use storage containers that are airtight and cannot easily be opened by temperature shifts or even clever critters. From our Instagram, repost from @alleelskeragnes. Gather together all the clothes that you are unlikely to wear until next spring. Wash everything. For your summer dresses, swimsuits, blouses, and any other specialty fabric you might only wear in the summer, wash with Eucalan. Spot treat any stains or marks. Make sure everything is dry before returning it to your closet, or store in air-tight storage containers. Vacuum seal storage bags can also be great for this. If hanging items, do not hang any heavy long sleeved items, as the hangers will leave dents in the shoulders when hung for a long period of time. What about those fall and winter clothes you are about to revisit? Chances are, they are wrinkly and looking tired, possibly even showing food or drink spots you never knew were there, if you forgot to clean them before setting them aside for half of the year. Sweaters in particular can look rather rumpled after being in storage, and benefit from having their fibers plumped through washing. Time to get them looking fresh and ready to wear for fall! From our Instagram, repost from @heyladyhey. Pull out anything you haven’t worn in the last 6 months from your closet or storage containers. If there are any items that don’t fit well or you don’t love anymore, put them aside to donate to a local charity. For the remaining sweaters and clothes, wash gently with your favourite scent of Eucalan. Lay them flat to dry, reshaping your knits if necessary. Now you are ready to wear your beautiful fall clothes! Knowing that they look their best should help take some of the sting out of the fact that summer is on its way out. From our Instagram, a repost from @cocoknits. The photos in this post are all from our Eucalan Instagram account. If you haven’t taken a look at what we’re sharing, you’re missing out! We also often repost from other beautiful Instagram accounts when they are using Eucalan, too. You just might find your new favourite feed! We are proud to sponsor Shibaguyz Designz, a company that integrates fashion design, crochet, knitting, photography, and graphic design all under one roof. The design studio is comprised of Shannon and Jason, who live in Seattle, Washington with their three Shiba Inu. Today, we interviewed Shannon to learn more about this duo’s many creative endeavors. How did you learn to knit? Crochet? All the members of my family were makers, from knitting and crochet, to woodworking and quilting, it was expected that we all learn some kind of art. Although all of the women in my family crocheted and knitted, my grandmother was the strongest influence in getting me started. The first actual memory I have is of sitting next to her on the couch and her teaching me to make bookmarks and circles that turned into hats. Pretty much anything I could do to hang out with her made it okay with me. The first projects she taught me to make were those little spiral bookmarks and “draft dodgers” that you put at the base of doors and windows. Then there was the year that everyone got a pair of slippers from me because I had learned to crochet, knit, AND sew. You know how it goes… first it’s an innocent bookmark, and then, suddenly, you’re the only guy in your class who can make thread lace doll dresses. Wait… was that just me? What is the process like for creating a new design or collection of new designs? I start my process one of two ways: I’ll either sketch the design, something that’s been wandering around in the corners of my brain waiting to be born, then I’ll start looking for the fiber and stitch pattern that will create the fabric I have in mind. The other way happens when I’m swatching for a new design and create a fabric that I LOVE but might not be right for that particular design. I’ll file that fabric swatch away (or keep in on my desk to remind me that I like it) then think about a garment that this fabric will work perfectly for. It all comes down to the fabric for me… the fabric created by the yarn and stitch pattern must match the vision of the final garment in my head… crochet or knit… it’s all down to the fabric. What is the best part about being a multicraftual team? The best part? Nothing is out of reach… whatever pops into my head I can do. Crochet a dress, knit a pullover, piece together a throw quilt, or sew a shirt. There are no limits… and with Jason being able to spin, weave, and cook like a four-star chef we pretty much have it all covered! What is your all-time favorite Shibaguyz design? That’s a bit like asking Carol Brady which of her children she loves the most… I just can’t answer it. I love something special about every design I make. I love to look at the texture of the crochet stitches in the T-Top from Crochet Geometry as much as the delicate thread motifs from the Motif Maxi Skirt from Designer Crochet or the simplicity of my knit “Cowl Neck Poncho.” Each is completely different (like Cindy, Jan, and Marcia…) but for different reasons and I derive little pleasures from seeing each detail and each nuance of the designs. That said… I will admit that the designs from my last two books, Crochet Geometry, and Designer Crochet, are designs that I’d saved for my own publication instead of selling the rights for. Some of the patterns are designs I’d been thinking of making for years but just couldn’t bear to part with them. So I kept them until we met the right publisher and we had a chance to put them into our own books the way we wanted them to me presented. For our readers who might not know, tell us a little bit more about the Shibaguyz Designz Studio. Jason’s studio is on the 2nd floor of our townhouse. He has a plethora of camera equipment, and graphic design tools strewn about… you’ll also find Atlas, one of our Shiba Inus, sitting on a chair close by as Jason is rarely allowed out of his visual range. My studio is on the 3rd floor (what once was a spare bedroom). Right now my studio looks like… like a department store the day after a clearance sale. I just finished up with our previous book so everything I needed to have on hand to finish it is close by. I have sketches hanging on the wall pinned with swatches, bins of rejected swatches sitting on my rocking chair (I LOVE rocking chairs!) and couch (where the other two Shibas, Apollo and Dallas, keep me company), inspiration yarn on the shelves next to me along with test yarn, test patterns, my empty coffee mug (that reminds me, I need to make more coffee), and a couple of chocolate bar wrappers that I think are empty now (that reminds me to tell Jason I’m out of chocolate). On my desk you can find paper with calculations, reference books, more swatches (I swatch a LOT) and somewhere in there I have a computer… surrounding me there are dress forms with muslin mock-ups draped on them, stitched projects pinned to blocking mats. All in all, not bad. There was a joke going around for the longest time about our ‘Yarn Tub.” We have a guest bath outside my studio door that acts as storage for yarn once my inventory gets a tad bit much. Jason occasionally teases that I need to crawl in the tub and take a yarn bath. I’ve considered it more than once (don’t judge me). Why do you prefer Eucalan to care for your finished designs? Have you discovered any other uses for Eucalan outside of the yarn world? There are so many reasons I use Eucalan… First, when creating fabric from yarn, which is what we as stitchers do, I have to know what the final product will be like once it is washed. Remember that many fibers can’t take a lot of abuse and the fact that Eucalan, being a gentle wash that does not have to be rinsed and can be left in, is perfect for everything I do from blocking swatches to washing completed garments. The no-rinse factor also makes it perfect because it cuts down on processing time when we have a LOT of swatches to block or garments to finish. Bottom line, the product works… it cleans with a minimum amount of stress on the fibers. Second, I am scent sensitive and have some contact sensitivity “issues” with my skin. Most commercial fabric washes have artificial fragrances added which cause me to break out or have problems breathing… not a good thing for someone who likes to breathe. When we spoke to the folks at Eucalan about this and found out y’all use natural fragrances derived from essential oils, we were hopeful. When we actually used the products and they didn’t affect my breathing or my skin, we were downright doing a happy dance. The fragrances are mild and leave everything just smelling fresh and clean. And funny you ask about other uses. We travel around the country a lot teaching at events and fiber festivals. Sometimes packing enough clothes for both of us along with teaching supplies, camera equipment, shoes… gotta have our shoes… can be an issue. On a recent teaching trip to STITCHES West, I had a mishap with a tall flat white and one of his shirts needed washed out. Jason had packed one of the Eucalan Getaway Gang travel kits in my bag so I gave it a try. LOVE LOVE LOVE how easy it was to just rinse out my shirt while I got ready for dinner that night and the shirt was ready to go the next day without a stain. THEN we were on an airplane to Pittsburgh and you know those little half and half containers they give you with your coffee? This particular one was under pressure and spewed half and half all over us in tiny little droplets. Those nifty little Eucalan Wipes took care of the droplets and didn’t stain my favorite traveling jacket (dark blue linen blend… yeah… shoes and suit jackets… it’s a thing with me). We’ve used the wipes on stains on the couch and even just used some on a damp cloth for larger spills on a chair when we didn’t want to get out the big cleaner with that weird hose. No rinse… no stain. Yes… we’re big fans. We travel a lot and we live with three very active Shiba Inu so we have plenty of chances to put Eucalan to the test. Eucalan fits perfectly into our studio and our life. Welcome back for another installment in our holiday gift guide series! We’d like to make your holiday shopping just a little bit easier by sharing some of our favourite products that are sure to delight the knitter or crocheter in your life. We also have three special prizes for our blog readers – read on for more details! Wrapture Fragrant Balm comes in a travel-friendly tin that’s perfect for stashing in your knitting bag. The jasmine-scented balm will keeps hard-working hands moisturized in the dry winter months! Clover’s Amour Crochet Hook Gift Set features colorful, color-coded hooks in ten sizes packed neatly in an attractive zippered case. Knitters will love the Clover Getaway Knitting Needle Gift Set, which includes 7 useful sizes of highly polished bamboo single point needles in a lovely fabric case that’s perfect for gifting. The Eucalan Gift Pack includes 100mL bottles in each of our 5 scents, making it a great gift option for prolific crafters. The Coco Knits Sweater Care Kit includes everything you need to block handmade sweaters with professional results and includes a 100mL bottle of Unscented Eucalan Delicate Wash. The Sirka Row Counter allows you to keep track of more than one number, which is great for complex patterns which require concurrent sets of instructions such as increases or decreases. An adorable needle gauge such as this Mitten Gauge from Retromantic Fripperies is a great stocking stuffer you know they’ll use. Inspire them each day with a Knitting or Crochet page-a-day 2016 Calendar that’s jam packed with great patterns (US customers, shop here). Be sure to mention your Ravelry ID or email address so that we can get in touch with you to arrange for the delivery of your prize. We will randomly select our winners to announce on our next blog post this Friday, December 18. Good luck! Please note: one entry per person, open only to US and Canadian residents. Fall is here! Now is the time to start bringing out your woolens, quilts and handmade items for the chilly autumn season. Eucalan is perfect for freshening up items which have been packed away for the summer – click here for free tutorials demonstrating the best way to wash and care for your specialty items such as quilts, woolens, furs, leather, and more! Sweater weather is once again here, and we recently spotted the Cocoknits Sweater Care Kit in the Fall issue of Knitty.com. 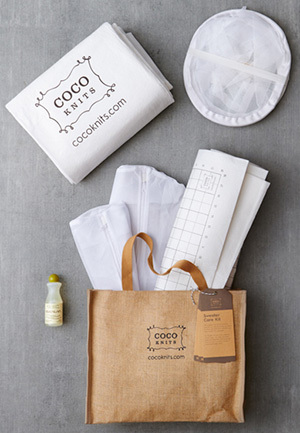 This clever kit includes everything you need to keep your handmade (and store-bought!) sweaters looking their best – including a small bottle of Eucalan! Handknitters will want to check out a brand-new instructional video, Basic Finishing Techniques: Transform Your Knitting With Blocking and More. Get answers to the most commonly-asked questions accompanied by detailed demonstrations (featuring Eucalan, of course!) from designer, author, and instructor Tanis Gray. This comprehensive DVD will help viewers achieve professional results for their handmade projects! Outside of the fibre arts world, Eucalan was recently featured on the Lingerie Journal as part of a feature by Kaaren Bedi, founder/designer of Layneau. In it, Kaaren shares her best tips for keeping luxury lingerie and heirloom pieces looking their best for the next generation. 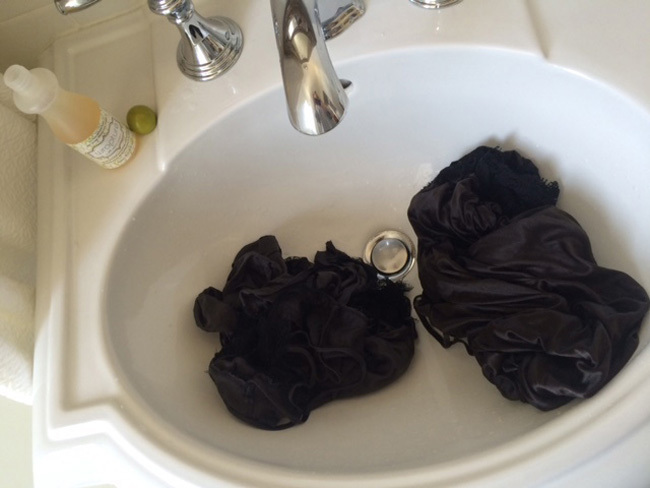 It should be no surprise that Kaaren prefers our delicate, no-rinse wash for preserving these special items; click here to read more of her sage advice over on the Lingerie Journal website.